CD40/CD40 ligand interaction is an important pathway for B and T cell cooperation and function; functional CD40 molecules have recently been found on nonhematopoietic cells. We detected CD40 in vivo on normal human respiratory epithelial cells and showed that its expression is increased on inflamed airway epithelium. Subsequently, we analyzed its expression and function on primary cultures of human airway epithelial cells. Our data show that CD40 is up-regulated by IFN-β and IFN-γ, its ligation increases the surface expression of CD54 and CD106 and it may stimulate the release of IL-6 and IL-8. The use of Janus kinase 3 (JAK3) and NF-κB inhibitors suggests that both basal and CD40-induced release of the two cytokines is JAK3-dependent. Using colocalization techniques, we revealed the existence of CD40/JAK3 and CD40/TNFR-associated factor 2 interplay. The extent of these interactions may be partial (2–40% of the cells) or massive (80–90% of the cells) in cultured cells. Stimulation via CD40 causes a significant increase in the number of cells expressing colocalization only in the cultures displaying low frequency of initial colocalization. Thus, airway epithelial cells, activated by CD40, may behave as effector cells of the inflammation process and should be considered priority targets for anti-inflammatory therapy. This work identifies CD40 and the correlated JAK3 signaling molecule as potential molecular targets to block the inflammatory functions of epithelial cells. Airway epithelial cells form a continuous pseudostratified layer in the lung, creating a tight barrier that protects underlying tissue from the external environment. However, recent studies suggest that airway epithelial cells are not simple bystanders: they interact with “classic” immune effector cells (i.e., T lymphocytes, monocytes, and eosinophils) in response to noxious endogenous and exogenous stimuli by the expression of surface molecules and the release of certain mediators (1). It has been shown that airway epithelial cells secrete a variety of chemokines, cytokines, extracellular matrix components, and lipid mediators (2, 3). Of these molecules, IL-8, GM-CSF, and monocyte chemoattractant protein are able to activate and attract neutrophils, eosinophils, monocytes, macrophages, and T lymphocytes to the inflamed tissue (4). Furthermore, airway epithelial cells are the target of pro-inflammatory cytokines such as TNF-α and IFN-γ, which are known to up-regulate the expression of some adhesion molecules (5). The interaction of cell adhesion molecules with their counter-receptors is important in the cross-talk between airway epithelium and inflammatory cells since it extends the activation and survival of the recruited cells. In particular, ICAM-1 (CD54) seems to play a crucial role in the pathophysiology of allergic inflammation. The experimental models of nasal and conjunctival specific challenges partially elucidated the kinetics of inflammatory events, showing that ICAM-1 is promptly expressed on epithelium after allergenic stimulation and that its expression parallels the cellular infiltration (6). CD40 is a 50-kDa gp belonging to a growing family of molecules including the nerve growth factor receptor, TNFR, and CD95 (Fas). It was initially described and studied on B cells, where stimulation with anti-CD40 mAb was shown to induce proliferation and isotype switching in the presence of appropriate costimuli (7). However, in recent years it has become clear that CD40 is expressed much more broadly, including expression on monocytes, dendritic cells, and some cell lines (8). Interestingly, CD40 expression has been demonstrated in situ on human or animal bronchial epithelial cells and in vitro on virus-transformed bronchial epithelial cells (9, 10, 11), as well as on epithelial cell lines from typical Th2 diseases (12). The CD40 ligand (CD40L/CD154)3, a member of the TNF family, is also much more widely expressed than initially thought; its expression appears not to be restricted to the activated CD4+ T cells, but is also present on eosinophils, mast cells, and basophils (13). In view of the critical role of CD40-CD40L interaction in the inflammatory process, studies on CD40/CD40L knockout (KO) mice showed that interference with this interaction is beneficial in several disease models. In particular, Jordana et al. (14) demonstrated that the Ag challenge in sensitized CD40L-KO mice caused markedly reduced airway eosinophilia in both bronchoalveolar lavage and tissue compared with control littermates. The present study demonstrates the expression of CD40 on human airway epithelial cells (HAEC) both in vivo and in vitro and its role in amplifying inflammatory responses within the respiratory tract. Moreover, CD40 signal transduction has been investigated in HAEC providing new insights about its molecular mechanisms. In particular, since CD40 signaling leads to the activation of Janus kinase 3 (JAK3)- and TNFR-associated factor 2 (TRAF2)-dependent pathways (15, 16), we demonstrated the interplay of CD40 with these two signaling molecules. This model may account for the wide range of effects observed and for the identification of a potential therapeutic target in allergic diseases. Specimens for immunohistochemical analysis were obtained from bronchial mucosa of both healthy (n = 3; 2 males, 1 female; mean age 43) and asthmatic patients (n = 3; 3 males; mean age 65), from healthy nasal mucosa (n = 3; 1 male, 2 females; mean age 38), and from nasal polyps (n = 3; 2 males, 1 female; mean age 58). Immunohistochemical staining was performed on formalin-fixed and paraffin-embedded samples. Two-micrometer tissue sections were cut onto slides and baked at 60°C for 30 min; slides were deparaffined in xylene, rehydrated through graded alcohols, and rinsed in distilled water. All samples were treated with hydrogen peroxide to quench endogenous peroxidase, and nonspecific sites were blocked with a 1:2 goat serum. Sections were incubated for 30 min with an appropriate dilution of CD40 Ab (rabbit polyclonal Ab IgG; Santa Cruz Biotechnology, Santa Cruz, CA) or its IgG control, rinsed in PBS at pH 7.6, and incubated for 20 min with multi-link biotinylated Ig (goat anti-mouse, -rabbit, -guinea pig, and -rat Ig; BioGenex, San Ramon, CA). Slides were incubated for 20 min with an HRP streptavidin solution and mAb binding was demonstrated by incubation with liquid diaminobenzidine substrated Pack (BioGenex). Samples were counterstained with Mayer’s hematoxylin (Sigma-Aldrich, St. Louis, MO), dehydrated through graded alcohols and xylene, and mounted in Eukitt (Electron Microscopy Sciences, Hatfield, PA). Finally, slides were examined under a light microscope (Olympus, Melville, NY). Primary epithelial cultures were obtained from nasal mucosa of 15 allergic patients (9 females, 6 males; mean age 51) undergoing surgery for therapeutic reasons. None of the subjects showed evidence of having suffered from respiratory infections in the previous 4 wk, nor were they under antihistaminic, nasal corticosteroid, or β2-agonist treatment. HAEC were collected by protease digestion (bacterial protease XIV, enzymatic activity 5.1 U/mg of solid; Sigma-Aldrich) as previously described (17). Briefly, tissue samples were incubated overnight at 4°C in the protease solution (0.25% in PBS), the cell suspension was washed and resuspended in medium. The cell viability assessed by trypan blue dye exclusion was >90%. Airway epithelial cells were cultured at 37°C in 5% CO2 in appropriate growth medium consisting of a combination of DMEM with Ham’s F12 (Life Technologies, Milan, Italy) (2:1) supplemented with 10% FBS, insulin (5 μg/ml), transferrin (5 μg/ml), hydrocortisone (0.4 mg/ml), cholera toxin (0.1 nM), triiodothyronine (2 nM), penicillin (50 μg/ml), streptomycin (50 μg/ml), and glutamine (2 mM). All reagents were obtained from Sigma-Aldrich. After 3–5 days, cell viability was evaluated by trypan blue dye exclusion (> 90%), epithelial cytokeratine-positive cells were checked with the specific Ab (CAM 5.2, BD Biosciences, Milan, Italy) and analyzed on an EPICS Elite flow cytometer (Coulter Pharmaceutical, Miami, FL). Only cultures containing >95% cytokeratine-positive cells were used for the experiments. The effect of cytokines on the modulation of CD40 was evaluated after verification of its presence on HAEC. Briefly, cells were cultured in 24-well plates to near confluence in the presence of rIFN-α (500 U/ml), rIFN-β (500 U/ml), rIFN-γ (500 U/ml), or rTNF-α (10 ng/ml) (all from Euroclone, Wethenby, U.K.). After 24 h, the cells were stained with IgG anti-CD40 mAb (EA-5; Ancell, Bayport, MN) and analyzed via flow cytometry. To assess the effects of CD40 triggering on adhesion molecule expression, epithelial cells were cultured in 24-well plates. When cells were near confluence, IgM anti-CD40 Ab (100 ng/ml, Caltag Laboratories, Burlingame, CA) was added to the culture; after 24 h cells were collected and ICAM-1 (CD54; Cymbus Biotechnology, Southampton, U.K.), and VCAM-1 (CD106; Cymbus Biotechnology) levels were evaluated by indirect immunofluorescence staining and flow cytometry. To determine the effects of CD40 ligation on cytokine/chemokine production, cells were cultured as described. At the indicated times, cell-free supernatants were harvested and stored at −80°C until cytokine/chemokine detection was performed; cells were harvested and counted to account for differences in cell number. Levels of mediators were measured with a specific ELISA kit (Quantikine; R&D Systems, Minneapolis, MN). The detection limit was 0.7 pg/ml and 10 pg/ml for IL-6 and IL-8, respectively. To examine the mechanisms of CD40 transduction, the above-mentioned experiments were also performed in the presence of NF-κB or JAK3 inhibitor. Briefly, HAEC were pretreated for 1 h with JAK3 inhibitor I (10 μg/ml, Calbiochem, Beeston, U.K.) or NF-κB inhibitor (50 μg/ml, NF-κB SN50 cell-permeable inhibitor peptide, Calbiochem), then the anti-CD40 IgM was added; cultures with the inhibitor alone were also performed. 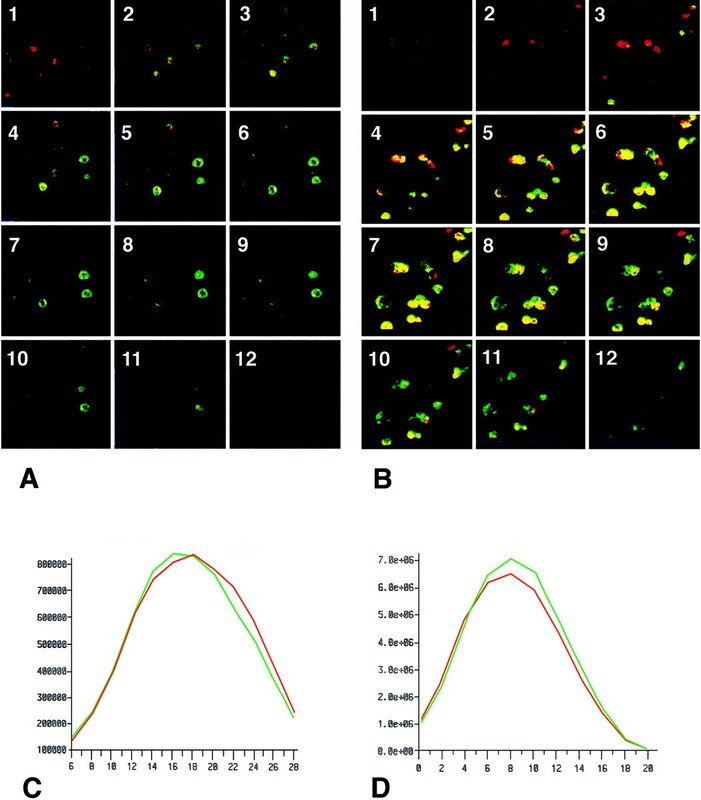 The number of surface Ags on epithelial cells was calculated on the basis of the mean fluorescent channel and the FITC/protein ratios of mAbs, using a set of fluorescent microbeads (Immunobrite V levels; Coulter) with a known content of molecular equivalent of soluble fluorescein as standards (18). After detachment with trypsin EDTA (Sigma-Aldrich), half of the cell suspension was incubated with IgM anti-CD40 mAb (1 μg/ml) at 37°C for 45 min. Subsequently, control and treated samples were permeabilized with ORTHOpermeafix (Ortho Diagnostic Systems, Raritan, NJ) at room temperature for 45 min and double indirect immunofluorescence was performed. For CD40/TRAF2 colocalization analysis, cells were incubated with 1 μg/ml of a mouse IgG1 anti-CD40 mAb (Immunotec, Luminy, France), and 5 μg/ml of rabbit polyclonal IgG anti-TRAF2 (Santa Cruz Biotechnology). The final incubation step was with both FITC-conjugated goat anti-mouse IgG (diluted 1/50, Immunotech) and PE-labeled goat anti-rabbit IgG (diluted 1/50, Southern Biotechnology Associates, Birmingham, AL). For double staining of CD40 and JAK3, the first staining was accomplished using a mouse anti-CD40 mAb (1 μg/ml) and the second staining was performed using the anti-JAK3 polyclonal serum (10 μg/ml, Upstate Biotechnology, Lake Placid, NY). The final incubation step was performed with the FITC-conjugated goat anti-mouse and the PE-labeled goat anti-rabbit IgG. Then cells were washed with PBS, cytocentrifuged in a Cytospin 3 (Shandon, Pittsburg, PA), and analyzed by laser scanning confocal microscopy. In negative controls the primary Ab was omitted. Labeled specimens were scanned with an ACAS 570 Interactive Laser Cytometer (Meridian Instruments, Okemos, MI) equipped with confocal optics. The system consisted of a 5W argon ion laser turned to 488 nm, an Olympus IMT-2 inverted microscope with a ×100 oil immersion objective (NA1.3) z axis control, an xy scanning stage, and a variable pinhole aperture all under 80486 computer coordination. The ACAS 570 was set up in fluorescence mode. FITC and strep-RED670 were excited at 488 nm. The computer converted fluorescence intensity into color as output image. The excitation was done at 20NW power and the filter constitution for emission detection was that conventionally used for FITC and strep-RED. To obtain good resolution, the pinhole and photomultiplier voltage were set at 40 and 25%, respectively. Data are expressed as mean ± SE. Data normally distributed were analyzed by the parametric Student t test, whereas those nonnormally distributed were analyzed by the Mann-Whitney U nonparametric test. Data were considered significant when the p value was <0.05 and highly significant when it was <0.01. Immunohistochemical analysis of CD40 expression in fixed tissue sections revealed that CD40 is present in vivo on normal human airway epithelium (Fig. 1⇓, A and B, panel III). 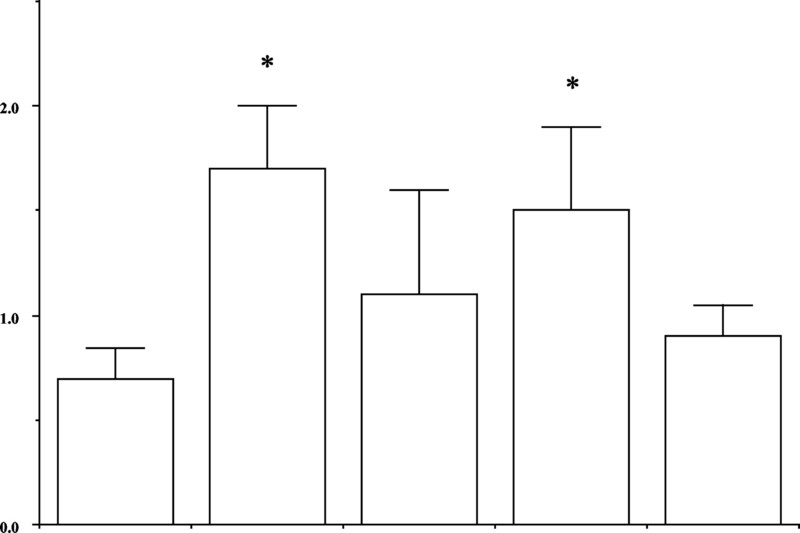 Interestingly, CD40 expression is highly increased in inflamed tissue (Fig. 1⇓, A and B, panel I). A, CD40 expression on human bronchial epithelium. The brown color identifies CD40 molecule (magnification ×100). Panel I and II: Immunohistochemical analysis of CD40 expression on bronchial mucosa of asthmatic patient (I) and its negative control (II). 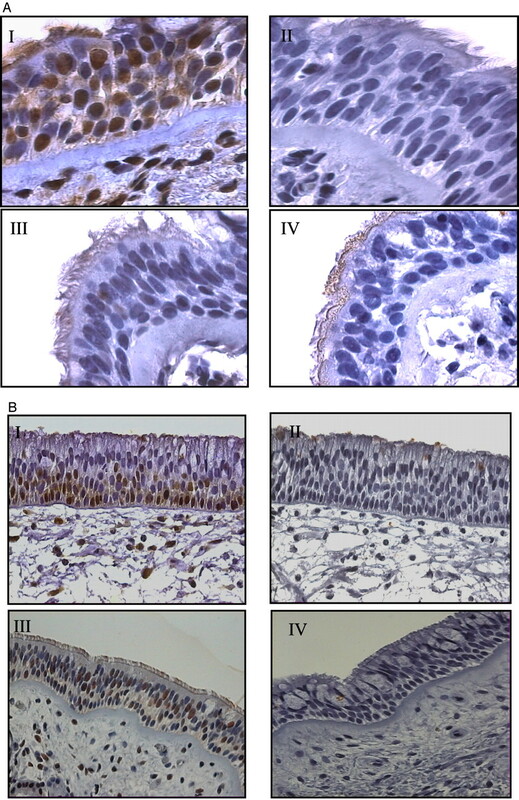 Panel III and IV: Immunohistochemical analysis of CD40 expression on bronchial mucosa of healthy subject (III) and its negative control (IV). B, CD40 expression on human nasal epithelium. The brown color identifies CD40 molecule (magnification ×40). Panel I and II: Immunohistochemical analysis of CD40 expressed on nasal mucosa of patient with polyposis (I) and its negative control (II). Panel III and IV: Immunohistochemical analysis of CD40 expressed on nasal mucosa of healthy subject (III) and its negative control (IV). HAEC constitutively expressed CD40; in all of the primary cultures >50% of HAEC stained positively for the CD40 molecule even though some heterogeneity was observed (range 51–89%). Preliminary studies were performed to ensure that cholera toxin added to the medium to allow optimal growth of primary epithelial cell cultures did not influence the expression of CD40. Experiments performed to determine whether the recombinant cytokines IFN-α, IFN-β, IFN-γ, or TNF-α modulated CD40 expression on HAEC showed that only IFN-β and IFN-γ were significantly effective in enhancing CD40 expression (p < 0.05; Fig. 2⇓). CD40 expression on adult human airway epithelial cells in basal condition and after incubation (24 h) with rIFN-γ, rIFN-α, rIFN-β (500 U/ml), and rTNF-α (10 ng/ml). Data are expressed as mean fluorescent channel ± SE of 15 experiments. ∗, p < 0.05. TRAF2 and JAK3 have been implicated as mediators of CD40 signaling in B cells (19, 20) and in some carcinomas (21). We analyzed the potential interactions between CD40 and these two molecules in HAEC using confocal microscopy, investigating the existence and/or induction of colocalization between CD40 and JAK3 or TRAF2. 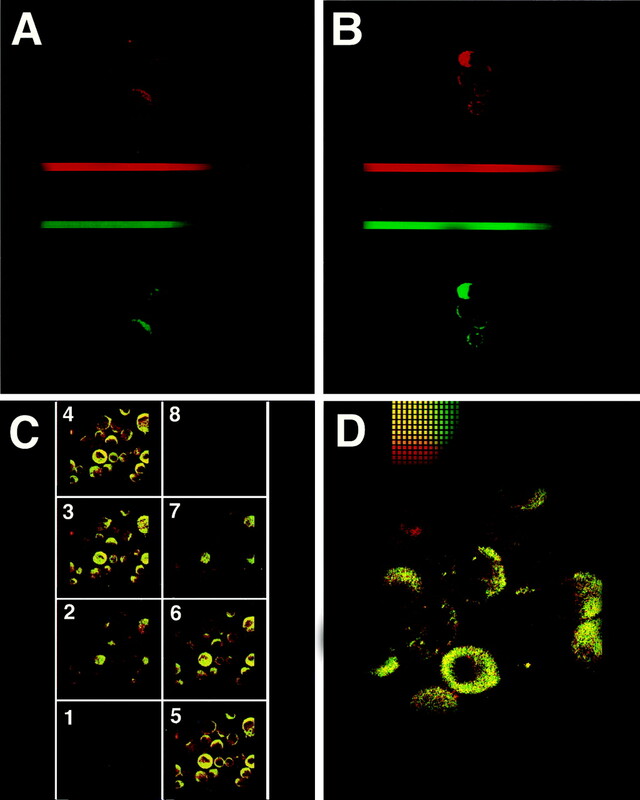 Three-dimensional reconstitution of serial confocal optical sections and the analysis of the alignment of the fluorescence peaks (AAFP) were assessed as complementary approaches to support the existence of true colocalization. By AAFP, we obtain a quantitative analysis evaluating the intensity of fluorescence as a function of the cell depth (expressed in micrometers). For there to be a true, massive colocalization, the green and red points of maximal fluorescence must be superimposed. In contrast, if there is no or very limited colocalization, the two curves are not superposed. For both CD40/JAK3 and CD40/TRAF2 colocalization, we observed heterogeneous results. We most often detected some level of basal colocalization, either partial (2–40%; Fig. 3⇓, A and C for JAK3/CD40 and TRAF2/CD40 colocalization, respectively) or massive (80–90%; Fig. 3⇓, B and D for JAK3/CD40 and TRAF2/CD40 colocalization, respectively); in cultures displaying limited basal positivity, stimulation with anti-CD40 mAb caused a significant increase (up to 80%) in the number of cells expressing colocalization. Analysis of intracellular colocalization of CD40/JAK3 (A and B) and CD40/TRAF2 (C and D) in airway epithelial cells in basal condition. The green staining identifies CD40, the red staining labels JAK3 or TRAF2, whereas the yellow staining defines the colocalization of the analyzed molecules. In Fig. 4⇓, green staining identifies CD40 and red staining JAK3. The two molecules are detected in primary cultures of human epithelial respiratory cells both in control cultures and in samples stimulated with anti-CD40 mAb. Confocal analysis on serial optical sections from the cell surface toward the interior shows that in the control culture only two cells display colocalization between CD40 and JAK3 (presence of yellow staining; Fig. 4⇓A) whereas all the cells in the stimulated culture are positive (presence of yellow staining; Fig. 4⇓B). The yellow staining is only observed in the internal sections, indicating that the colocalization occurs at the cytoplasmic level; this is confirmed by AAFP (Fig. 4⇓, C and D). Analysis of intracellular localization of CD40 and JAK3 in primary cultures of human epithelial respiratory cells. The green staining identifies CD40 and the red staining JAK3. 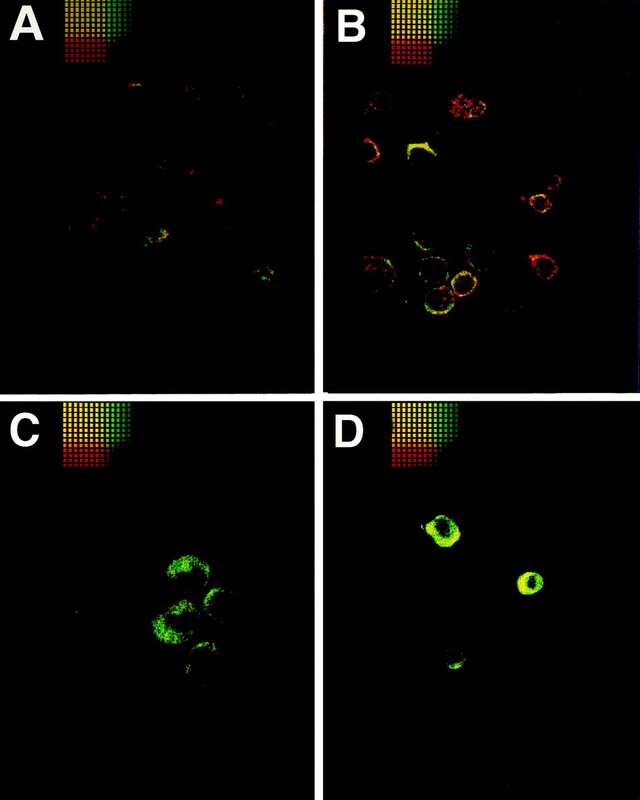 The presence of yellow staining on serial optical sections from the cell surface toward the interior of the cells (from 1 to 12) shows the colocalization of CD40 and JAK3 in basal condition (A) or in stimulated culture (B). The intensity of fluorescence as a function of the cell depth (expressed in micrometers) in control and stimulated cultures is shown in C and D, respectively. In Fig. 5⇓, green staining identifies CD40 and red staining TRAF2. The two molecules are detected in primary cultures of human epithelial respiratory cells both in control cultures (Fig. 5⇓A) and in samples stimulated with anti-CD40 mAb (Fig. 5⇓B). Confocal analysis again shows that in the control culture only a few cells display a colocalization between CD40 and TRAF2 (not shown) whereas all the cells in the stimulated culture are positive and present an intense yellow staining at the cytoplasmic level (Fig. 5⇓, C and D). Analysis of intracellular localization of CD40 and TRAF2 in primary cultures of human epithelial respiratory cells. The green staining identifies CD40 and the red staining TRAF2 both in control cultures (A) and in samples stimulated with anti-CD40 mAb (B). The presence of yellow staining on serial optical sections from the cell surface toward the interior of the cells (from 1 to 8) shows the colocalization of CD40 and TRAF2 in stimulated cultures (C and D). To determine whether CD40 engagement modulated expression of ICAM-1 and/or VCAM-1 on airway epithelium, HAEC were cultured with or without anti-CD40 IgM. Cells were then collected and analyzed for the surface expression of adhesion molecules via flow cytometry. A basal expression of both ICAM-1 and VCAM-1 was observed and CD40 ligation was able to significantly increase their levels (p < 0.05, each comparison; Fig. 6⇓, Table I⇓). 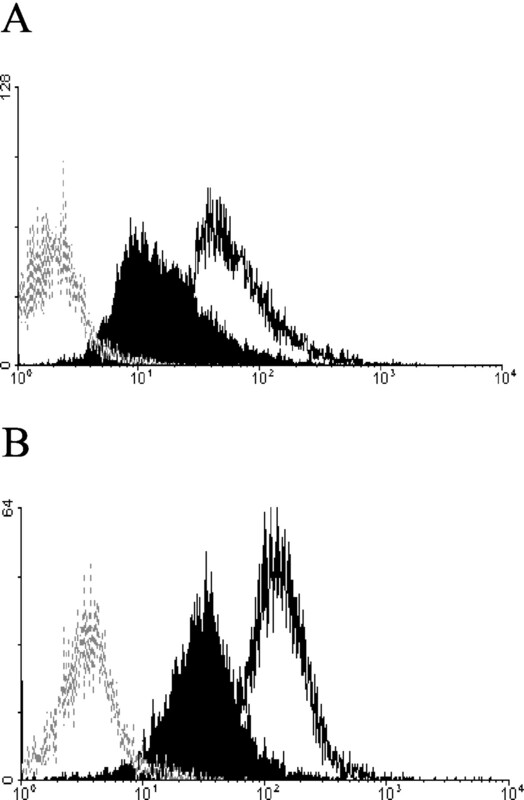 Flow cytometry analysis of the expression of VCAM-1 (A) and ICAM-1 (B) in human airway epithelial cultures in basal condition (filled histogram) or stimulated cultures (open histogram). Each figure is representative of at least three different experiments. Dotted histogram represents the negative control. To determine whether CD40 cross-linking was able to affect the release of chemokines/cytokines, HAEC were cultured in the presence and absence of anti-CD40 IgM. The supernatants analyzed for the presence of IL-6 and IL-8 showed that all of the cultures spontaneously secreted low levels of IL-6 and high levels of IL-8. As mentioned for CD40 expression, preliminary studies on the influence of cholera toxin on IL-6 or IL-8 release were performed and no effects were found. As shown in Tables II⇓ and III⇓, the pattern of IL-6 and IL-8 release induced by CD40 triggering was heterogeneous: whereas in some of the cultures anti-CD40 IgM increased the release of both mediators, in others it failed to induce either IL-6 or IL-8 release. NF-κB inhibitor also induced a heterogeneous response; interestingly, only in cultures where CD40 stimulation up-regulated cytokine/chemokine release, NF-κB inhibitor was able to decrease their production (NP3, NP4, NP5, and NP7 for IL-6; NP3, NP6, NP10, NP11, and NP13 for IL-8). In contrast, in one stimulated cell culture (NP5) a 2-fold increase in IL-8 production following incubation with the NF-κB inhibitor was observed. When incubated with the NF-κB inhibitor, virtually all unstimulated cultures showed no reduction in the release of both IL-6 and IL-8, with the exception of IL-8 secretion in two cultures (NP5 and NP12). By contrast, JAK3 inhibitor I caused homogeneous effects: its presence virtually suppressed both basal and stimulated secretion of the two mediators, suggesting that this was the main pathway controlling their production. The role of inflammation in the pathophysiology of the allergic reaction has been extensively described in the past (22, 23). Concerning allergic inflammation in the airways, a number of inflammatory mediators are released not only by mast cells and eosinophils, but also by other mononuclear cells recruited into the airway mucosa (24, 25). In this context, different cell types are involved in the amplification of the inflammatory reaction, including neutrophils, fibroblasts, tissue macrophages, and immunocompetent cells (26, 27, 28). Airway epithelial cells, which represent the first barrier to aeroallergens, may also be deeply involved in this environment, although their active role in the inflammatory response has never been investigated in-depth. It is well known that exacerbations of allergy in the respiratory tract are related to locoregional inflammation, sustained by a combination of both cytokines and chemokines (29, 30, 31). Despite the central role of the secretory activity in the development of the inflammatory milieu in allergic patients, several pieces of evidence suggest other potential mechanisms. For example, CD40L KO mice have a significantly reduced inflammatory response following a specific allergen challenge (14), a finding that together with other evidence (32, 33) assigns a central role in the inflammatory reaction to CD40, at least in upper respiratory airway allergy. Nevertheless, until now, CD40 has principally been studied on different immunocompetent cells, when similar activity on epithelium could account for a more specific role of epithelial cells in maintaining and amplifying the inflammatory loop. Using immunohistochemical studies, we demonstrated that CD40 is expressed on normal epithelial cells of the respiratory tract and that it is significantly up-regulated on inflamed tissues. Although these data are important for demonstrating the presence of CD40 on epithelial cells and its modification in inflamed tissues, they do not provide any functional evidence for a potential mechanism of action. In the attempt to mimic the conditions in which epithelial cells act during the allergic reaction, we investigated the effects of certain cytokines produced upon activation by the cells circumventing the epithelial targets: IFN-α, produced by leukocytes, TNF-α by the monocyte/macrophage lineage, IFN-β by resident stromal cells, and IFN-γ by T lymphocytes as well as by other immunocompetent cells during both specific and nonspecific immune-response (34, 35, 36). Under these culture conditions we investigated whether CD40 could have a potential functional role on human primary respiratory epithelial cultures. Preliminary experiments were performed on cells from both nasal and lung samples and interestingly, no significant differences were found between the two cell sources (data not shown). This finding, the difficulty of obtaining normal human lung tissue, and the knowledge that immortalized cell lines do not precisely represent their in vivo counterpart, supported our use of cultures of epithelial cells derived from nasal polyps. Moreover, nasal polyps represent a good model of chronic airway inflammation because the two conditions share histopathologic features (37). Results described herein demonstrate that CD40 is expressed on primary human respiratory epithelial cultures from allergic patients, thus confirming our original observation of CD40 expression on epithelial cells in vivo, using an immunohistochemical approach. It has previously been shown that in vitro IFN-γ induces high CD40 levels on airway cells (38, 39) and we showed that also IFN-β results in a high increase of CD40 expression on freshly isolated epithelial cells from nasal mucosa. The sole (over-) expression of CD40 does not account for a functional role of this molecule on epithelial cells. For this reason, cross-linking experiments (which simulate the in vivo interaction with the relevant ligand) were performed and an increase in ICAM-1 and VCAM-1 expression was found. Together with the CD40-CD40L interaction, these molecules are particularly important for allowing an intimate contact between epithelial and immunocompetent cells (40). Another direct consequence of CD40 ligation is the secretion of two inflammatory mediators (IL-6 and IL-8), at least in half the samples analyzed. The response to CD40 triggering was in line with the variability observed in basal culture conditions; interestingly, it was also in accordance with the results obtained in confocal microscopy. Both approaches showed the existence of multiple outcomes following CD40 stimulation and highlighted the importance of the basal heterogeneity, thus suggesting the presence of different regulatory key points along the CD40 triggering pathway. It could be hypothesized that if the initial colocalization of CD40 and transcription factors is high the consequent stimulation of CD40 will have less or no effect. On the contrary, in the case of no or low initial colocalization, the effects of CD40 stimulation would result in the association of CD40 to downstream factors, thus determining different effects such as mediator release. The presence of the JAK3 inhibitor always determined a strong decrease in mediator release, independently from the amount of mediator released in basal condition. The addition of NF-κB to cell cultures suggested the existence of a complex interplay between CD40 and NF-κB; regarding this pathway we can just hypothesize that the initial heterogeneity may play a role, although our data did not show any clear relationship. The existence of an inflammatory microenvironment already present in vivo, could actively prime epithelial cells as also suggested by results obtained in confocal microscopy and discussed below. Although other mediators not investigated in the present study may be produced following activation via CD40, IL-6 and IL-8 can be considered typical proinflammatory signals and have the capability of recruiting and/or activating lymphocytes, macrophages, granulocytes, and endothelial cells (41, 42). Along these lines, one could speculate that over-expression of ICAM-1 and VCAM-1 is due to a complex mechanism in which IL-6, IL-8, and other mediators may act in concert. In contrast, the notable finding that adhesion molecule up-regulation is virtually independent of NF-κB and JAK3 owing to the stability (half-life) of ICAM-1 and VCAM-1, and the fact that IL-6 and IL-8 release is mainly related to the JAK3 signaling molecule, suggest that the two biological responses could depend on separate downstream events in CD40 signaling. Despite the clear evidence obtained on CD40 up-regulation and triggering, the analysis of the internal signaling in terms of specific protein recruitment and colocalization indicated that more sophisticated and heterogeneous mechanisms are involved in the intracellular cascade. Data from the literature report that in lymphoid B cells, the intracytoplasmic CD40 tail is preassociated with TRAF2 and JAK3 (43): our results demonstrate that in primary cultures of human respiratory cells from nasal polyps, there is great heterogeneity in its association with signaling molecules. Cultures that display low or partial levels of colocalization are sensitive to stimulation with anti-CD40 mAb and this treatment causes a very efficient recruitment of JAK3 to CD40. However, in cultures that appear to be fully preactivated, stimulation with anti-CD40 mAb does not amplify the extent of colocalization. This finding confirms the existence of a complex interplay that can lead to the inhibition of JAK3 activation in cells subjected to different activating stimuli (44). With respect to CD40/TRAF2 interactions, we detected a similar situation since in some cultures there was a low basal level of colocalization that increased upon activation with anti-CD40 mAb, whereas other cultures displayed a massive colocalization that was not modified by the stimulation. These data strongly suggest that in epithelial respiratory cells, the presence or the induction of association between CD40 and JAK3 or CD40 and TRAF2 truly represents a first step in the activation of the JAK3- and TRAF2-dependent pathways. Our data also suggest that even though all of the cultures express CD40, JAK3, and TRAF2, only the cells that have been primed in vivo, therefore displaying some preassociation between CD40 and the two signaling molecules, are sensitive to anti-CD40 stimulation. One may speculate upon the need for an initial signal delivered in vivo to make epithelial cells sensitive to CD40 signaling. Although not demonstrated by our experiments, the heterogeneity observed may depend on the in vivo microenvironment; besides expressing various types of cell-adhesion molecules, a low-affinity receptor for IgE on airway epithelial cells has also been described (45). It is likely that epithelial cells may play a role in the microenvironmental control of inflammation by their interaction with inhalant allergens. We obtained evidence that CD40 ligation results in a modification of surface molecules involved in the cross-talk with immunocompetent cells and that an intracellular signaling pathway is consistent with specific mediator release. These findings allow the definition of a functional model where epithelial cells may play an important role in maintaining the airway inflammatory reaction following allergic stimuli. IgE interaction with the allergen results in the release of newly and preformed mast cell mediators, and as a consequence, primary recruitment of inflammatory cells occurs (46). These cells, together with the stromal layer, are activated by nonspecific stimuli and initiate the secretion of other more specific cytokines, such as IFN-β and IFN-γ (47). Epithelial cells are highly susceptible to these mediators, resulting in a significant up-regulation of CD40. In the same environment, CD40L-positive lymphocytes can directly interact with the CD40 over-expressed on epithelial cells, thus mediating the transduction of the activating signal and promoting the secretion of IL-6 and IL-8. On the same cells, using a different pathway, ICAM-1 and VCAM-1 are contemporarily up-regulated. Under these conditions, the cross-talk between epithelial and inflammatory cells is amplified. This network of interactions, which includes immune-competent and resident cells, results in a self-maintaining inflammatory loop, which could at least in part explain the frequent association between allergy and locoregional inflammation. Our suggested contribution of airway epithelial cells to the pathogenesis of allergic airway disease is supported by the model by Richter and coworkers (48) of the lung epithelial-mesenchymal trophic unit. They propose that the lung epithelial-mesenchymal trophic unit functions as an integrated unit in which bronchial epithelium coordinates and regulates the underlying fibroblast sheath and other circumventing cells such as endothelial and smooth muscle cells through autocrine and paracrine activities. In this context, identifying in CD40-CD40L interaction one of the possible mechanism by which epithelial cells promote and sustain airway inflammation could be a first step in the control of the aberrant responses in airway diseases. Moreover, elucidating the mechanism by which signaling through CD40 protein activates specific downstream pathways should lead to a better understanding of how CD40 signaling events are regulated, thus highlighting new molecular targets for novel therapies. ↵1 This work was supported in part by a Ministero dell’Universita’e della Ricerca Scientifica e Tecnologica Grant (to G.W.C.) and Nouvelles Recherches Biomedicals-Vaincre le Cancer. J.G.-M. is a recipient of an Associazione per la Ricerca delle Malattie Allergiche ed Immunologiche fellowship. S.Ol. is supported by the Swedish Society of Medical Research. ↵3 Abbreviations used in this paper: CD40L, CD40 ligand; KO, knockout; HAEC, human airway epithelial cells; JAK3, Janus kinase 3; TRAF2, TNFR-associated factor 2; AAFP, analysis of the alignment of the fluorescent peaks. Tomee, J. F., R. van Weissenbruch, G. R. de Monchy, H. F. Kauffman. 1998. Interactions between inhalant allergen extracts and airway epithelial cells: effect on cytokine production and cell detachment. J. Allergy Clin. Immunol. 102:75. Holgate, S. T., P. M. Lackie, D. E. Davies, W. R. Roche, A. F. Walls. 1999. The bronchial epithelium as a key regulator of airway inflammation and remodelling in asthma. Clin. Exp. Allergy 29:(Suppl. 2):90. Striz, I., T. Mio, Y. Adachi, S. Carnevali, D. J. Romberger, S. I. Rennard. 2000. Effects of interferons α and γ on cytokine production and phenotypic pattern of human bronchial epithelial cells. Int. J. Immunopharmacol. 22:573. Vliagoftis, H., A. D. Befus, M. D. Hollenberg, R. Moqbel. 2001. Airway epithelial cells release eosinophil survival-promoting factors (GM-CSF) after stimulation of proteinase-activated receptor 2. J. Allergy Clin. Immunol. 107:679. Jagels, M. A., P. J. Daffern, B. L. Zuraw, T. E. Hugli. 1999. Mechanisms and regulation of polymorphonuclear leukocyte and eosinophil adherence to human airway epithelial cells. Am. J. Respir. Cell. Mol. Biol. 21:418. Canonica, G. W., G. Ciprandi, G. Passalacqua, G. Pesce, A. Scordamaglia, M. Bagnasco. 1997. Molecular events in allergic inflammation: experimental models and possible modulation. Allergy 52:25. Foy, T. M., A. Aruffo, J. Bajorath, J. E. Buhlmann, R. J. Noelle. 1996. Immune regulation by CD40 and its ligand GP39. Annu. Rev. Immunol. 14:591. Gormand, F., F. Briere, S. Peyrol, M. Raccurt, I. Durand, S. Ait-Yahia, S. Lebecque, J. Banchereau, Y. Pacheco. 1999. CD40 expression by human bronchial epithelial cells. Scand. J. Immunol. 49:355. Atsuta, J., S. A. Sterbinsky, J. Plitt, L. M. Schwiebert, B. S. Bochner, R. P. Schleimer. 1997. Phenotyping and cytokine regulation of the BEAS-2B human bronchial epithelial cell: demonstration of inducible expression of the adhesion molecules VCAM-1 and ICAM-1. Am. J. Respir. Cell Mol. Biol. 17:571. Propst, S. M., R. Denson, E. Rothstein, K. Estell, L. M. Schwiebert. 2001. Proinflammatory and Th2-derived cytokines modulate CD40-mediated expression of inflammatory mediators in airway epithelia: implications for the role of epithelial CD40 in airway inflammation. J. Immunol. 165:2214. Amsellem, C., C. Durieu, M. T. Chambe, S. Peyrol, Y. Pacheco. 2002. In vitro expression of Fas and CD40 and induction of apoptosis in human cystic fibrosis airway epithelial cells. Respir. Med. 96:244. Schonbeck, U., F. Mach, P. Libby. 2000. CD154 (CD40 ligand). Int. J. Biochem. Cell Biol. 32:687. Lei, X. F., Y. Ohkawara, M. R. Stampfli, C. Mastruzzo, R. A. Marr, D. Snider, Z. Xing, M. Jordana. 1998. Disruption of antigen-induced inflammatory responses in CD40 ligand knockout mice. J. Clin. Invest. 101:1342. Leo, E., K. Welsh, S. Matsuzawa, J. M. Zapata, S. Kitada, R. S. Mitchell, K. R. Ely, J. C. Reed. 1999. Differential requirements for tumor necrosis factor receptor-associated factor family proteins in CD40-mediated induction of NF-κB and Jun N-terminal kinase activation. J. Biol. Chem. 274:22414. Revy, P., C. Hivroz, G. Andreu, P. Graber, C. Martinache, A. Fischer, A. Durandy. 1999. Activation of the Janus kinase 3-STAT5a pathway after CD40 triggering of human monocytes but not of resting B cells. J. Immunol. 163:787. Oddera, S., F. Cagnoni, P. Dellacasa, G. W. Canonica. 2000. Effects of mizolastine in vitro on human immunocompetent and airway cells: evidence for safety and additional property. Int. Arch. Allergy Immunol. 123:162. Ferlazzo, G., C. Semino, G. Quartarone, G. Pietra, G. Melioli. 1997. Adherent neoplastic cells grown at confluence downregulate HLA class I expression and enhance susceptibility to lysis mediated by natural killer cells. Tissue Antigens 50:459. Werneburg, B. G., S. J. Zoog, T. T. Dang, M. R. Kehry, J. J. Crute. 2001. Molecular characterization of CD40 signaling intermediates. J. Biol. Chem. 276:43334. Hanissian, S. H., R. S. Geha. 1997. JAK3 is associated with CD40 and is critical for CD40 induction of gene expression in B cells. Immunity 6:379. Eliopoulos, A. G., C. Davies, P. G. Knox, N. J. Gallagher, S. C. Afford, D. H. Adams, L. S. Young. 2000. CD40 induces apoptosis in carcinoma cells through activation of cytotoxic ligands of the tumor necrosis factor superfamily. Mol. Cell Biol. 20:5503. Passalacqua, G., S. Venturi, P. Zoccali, S. Oddera, F. Cagnoni, M. State, C. Doucet, B. Azzarone, G. W. Canonica. 1998. Cytokines and airways: recent insights and therapeutic implications. Pulm. Pharmacol. Ther. 11:375. Broide, D. H.. 2001. Molecular and cellular mechanisms of allergic disease. J. Allergy Clin. Immunol. 108:(Suppl.):S65. Renauld, J. C.. 2001. New insights into the role of cytokines in asthma. J. Clin. Pathol. 54:577. Chung, K. F., P. J. Barnes. 1999. Cytokines in asthma. Thorax 54:825. Teran, L. M., M. Mochizuki, J. Bartels, E. L. Valencia, T. Nakajima, K. Hirai, J. M. Schroder. 1999. Th1- and Th2-type cytokines regulate the expression and production of eotaxin and RANTES by human lung fibroblasts. Am. J. Respir. Cell Mol. Biol. 20:777. Gibson, P. G., J. L. Simpson, N. Saltos. 2001. Heterogeneity of airway inflammation in persistent asthma: evidence of neutrophilic inflammation and increased sputum interleukin-8. Chest 119:1329. Cheng, G., T. Ueda, F. Eda, M. Arima, N. Yoshida, T. Fukuda. 2001. A549 cells can express interleukin-16 and stimulate eosinophil chemotaxis. Am. J. Respir. Cell Mol. Biol. 25:212. Greenfeder, S., S. P. Umland, F. M. Cuss, R. W. Chapman, R. W. Egan. 2001. Th2 cytokines and asthma: the role of interleukin-5 in allergic eosinophilic disease. Respir. Res. 2:71. Lukacs, N. W.. 2001. Role of chemokines in the pathogenesis of asthma. Nature Rev. Immunol. 1:108. Zhang, Y., H. J. Coo, B. Graf, H. Meekins, T. J. Smith, R. P. Phipps. 1998. CD40 engagement up-regulates cyclooxigenase-2 expression and prostaglandin E2 production in human lung fibroblasts. J. Immunol. 160:1053. Pawankar, R., M. Okuda, H. Yssel, K. Okumura, C. Ra. 1997. Nasal mast cells in perennial allergic rhinitis exhibit increased expression of FcεRI, CD40L, IL-4, and IL-13, and can induce IgE synthesis in B cells. J. Clin. Invest. 99:1492. Akbar, A. N., J. M. Lord, M. Salmon. 2000. IFN-α and IFN-β: a link between immune memory and chronic inflammation. Immunol. Today 21:337. Roca-Ferrer, J., J. Mullol, A. Xaubet, P. Benitez, M. Bernal-Sprekelsen, J. Shelhamer, C. Picado. 2001. Proinflammatory cytokines and eosinophil cationic protein on glandular secretion from human nasal mucosa: regulation by corticosteroids. J. Allergy Clin. Immunol. 108:87. Lukacs, N. W., C. Hogaboam, S. W. Chensue, K. Blease, S. L. Kunkel. 2001. Type 1/type 2 cytokine paradigm and the progression of pulmonary fibrosis. Chest 120:(Suppl.):5S. Jahnsen, F. L., G. Haraldsen, J. P. Aanesen, R. Haye, P. Brandtzaeg. 1995. Eosinophil infiltration is related to increased expression of vascular cell adhesion molecule-1 in nasal polyps. Am. J. Respir. Cell Mol. Biol. 12:624. Tanaka, H., K. Maeda, Y. Nakamura, M. Azuma, H. Yanagawa, S. Sone. 2001. CD40 and IFN-γ dependent T cell activation by human bronchial epithelial cells. J. Med. Invest. 48:109. Zhao, Z., Y. Qian, D. Wald, Y. F. Xia, J. G. Geng, X. Li. 2003. IFN regulatory factor-1 is required for the up-regulation of the CD40-NF-κB activator 1 axis during airway inflammation. J. Immunol. 170:5674. Frieri, M.. 1999. Corticosteroid effects on cytokines and chemokines. Allergy Asthma Proc. 20:147. Lloyd, C.. 2002. Chemokines in allergic lung inflammation. Immunology 105:144. Lee, H. H., P. W. Dempsey, T. P. Parks, X. Zhu, D. Baltimore, G. Cheng. 1999. Specificities of CD40 signaling: involvement of TRAF2 in CD40-induced NF-κB activation and intercellular adhesion molecule-1 upregulation. Proc. Natl. Acad. Sci. USA 96:1921. Siepmann, K., G. Wohlleben, D. Gray. 1996. CD40-mediated regulation of interleukin-4 signaling pathways in B lymphocytes. Eur. J. Immunol. 26:1544. Campbell, A. M., A. M. Vignola, P. Chanez, P. Godard, J. Bousquet. 1994. Low-affinity receptor for IgE on human bronchial epithelial cells in asthma. Immunology 82:506. Krishnaswamy, G., J. Kelley, D. Johnson, G. Youngberg, W. Stone, S. K. Huang, J. Bieber, D. S. Chi. 2001. The human mast cell: functions in physiology and disease. Front. Biosci. 6:D1109. Howarth, P. H., M. Salagean, D. Dokic. 2000. Allergic rhinitis: not purely a histamine-related disease. Allergy 64:7. Richter, A., S. M. Puddicombe, J. L. Lordan, F. Bucchieri, S. J. Wilson, R. Djukanovic, G. Dent, S. T. Holgate, D. E. Davies. 2001. The contribution of interleukin (IL)-4 and IL-13 to the epithelial-mesenchymal trophic unit in asthma. Am. J. Respir. Cell Mol. Biol. 25:385.